There are so many fun and creative favor ideas used at baby showers today. But, sometimes a little help is needed to find that perfect favor to go with a theme. We decided that the best way for us to help other hostesses is for everyone to share their ideas. So we are putting together some of the best favor ideas sent in from our fabulous readers. This page was put together by you and for you to share your ideas to help other hostesses with their hosting. Feel free to browse the ideas below. 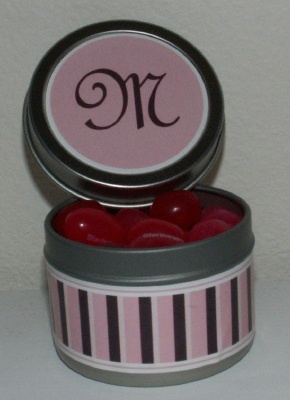 We also have some great ideas for favors on our favors page. Do you have a great favor idea? Share Your Idea With Us! If you have a great favor idea, click here to skip to the bottom of the page and add your idea. My daughters theme is "A baby is blooming" so I wanted a unique shower favor to go with this theme. It is a tea light flower lollipop favor. I printed and cut out my flowers, glued them to the popsicle sticks, let them dry, using double sided tape I taped the tea light candles to the center of the flower pressing down, and as I pressed down I got the edges of the flower petals and folded them upward slightly. I topped them off with a cello wrap, ribbon, baby pacifier and tag with a poem. From (name of mom-to-be)'s shower to yours! It's really simple and can be used for bath gel, bath bubbles and homemade soaps. My sister had already chosen the baby's name Madisson Ranae before the party, so I decided to do cute favors to match the name. We purchased round tins and some pink and brown stripe stickers to put on them. On the top we had them do the baby's initial- M.
It turned out really elegant. We bought it online at www.sophiesfavors.com. We filled it with pink jellybeans. You can put anything in them once the jellybeans are gone. My sister gave out coffee mugs at her baby shower as favors. They had printed up all of the shower info on them. Everyone loved the idea! For a different look, instead of the sticker you could glue a plastic baby pin to make it look like a diaper. Pretty in Pink and Chocolate Favor: I simply folded pink napkins to resemble diapers, tucked in a couple of Hershey Kisses and a Mint Pacifier (made with two lifesaver mints and a jellybean - 'glued' together with white chocolate) and added a tag that said: "The Mr. and Mrs. shared some kisses and created a new little Misses". 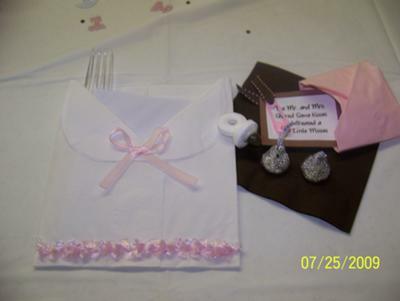 I also made diaper shirts from larger white napkins and tucked games inside with the fork at each place setting. Measuring 1.5 x 3 inches, these soaps have remarkable detail! Handmade with Moisturizing Shea Butter soap, you can have your choice of color and fragrance! Each soap comes with a free cellophane bag! I know that favors are a way of saying thank you to your guests but how many people actually use or save the items given as favors? Not me! In lieu of favors my daughter and I have decided to buy small baby items such as socks, pacifiers, lotions etc. and donate them to a local pregnancy center in honor of our guests. Locations can be found in your local phone book. This favor goes with the Noah's Ark diaper cake I made. It is primarily made of felt and contains almonds in a candy coated shell. For my daughter's baby shower, we put together seed packet favors for the guests. We took flower and garden seeds and created a cover to slip over it. Then we had the name and the date of the baby shower on it. The guests loved it and it was very inexpensive to make. We had a mod mom baby shower with the colors pink and chocolate brown. I found some really cute chocolate brown tootsie roll organza bags online. We filled them with pink chocolate covered almonds. They turned out so cute! For my cousin's baby shower, they used a mod mom theme for the party. For the favors, they gave us miniature baby bottles with pink jelly beans in them. 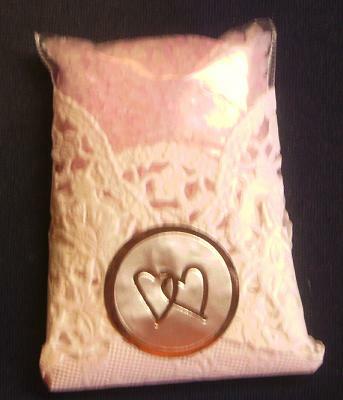 They had cute pink and chocolate polka dot ribbon on them and a mod mom themed tag that had the shower info on them. 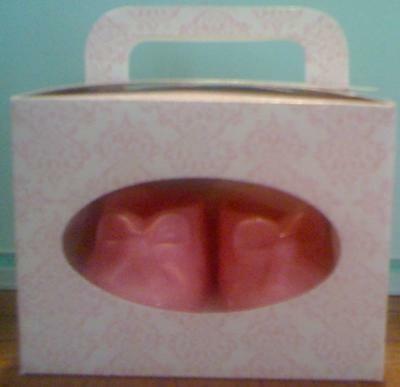 For our upcoming shower I bought white boxes from Dollar Tree (Pkg. of 12) and used cute carriage die cuts and baby heads that I cut out and decorated w/ a small bow and drew a face in. And on the back I printed on card stock our thank you and glued a plastic baby pin on top. The box will be filled w/ pink and yellow Easter grass and candy. I like to use mini sparkling ciders for my favors! They are so cute and I just tie a bow with a cute baby charm around the neck of the bottle. I know there not going to get thrown away when people go home and there a big hit, and look very elegant. 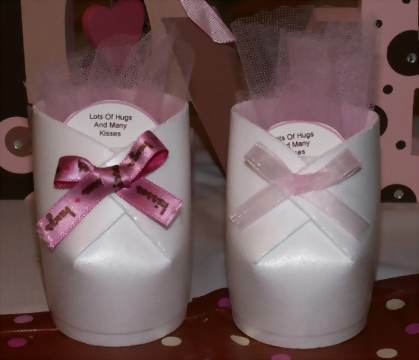 I used a candy mold and candy wafers to make cute and tasty pink baby booties favors. The box was actually a valentine inspired box, but complimented the booties well. For my daughter's baby shower, I made a spoonful of kisses for the baby shower favors. They turned out really cute. 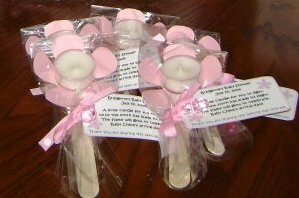 To make this baby shower favor, I used a package of clear plastic spoons and a package of Hershey kisses. We placed a few kisses in each spoon and covered it with a tulle circle (we used pink for a baby girl). Then we secured it in place with a ribbon. I made cute tags to go on it with the baby shower information on it. Here is the poem I used on the tags. For sharing in our gift from above. 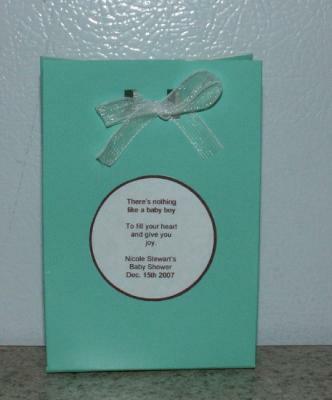 It turned out to be an inexpensive favor and the guests really thought the poem was cute. 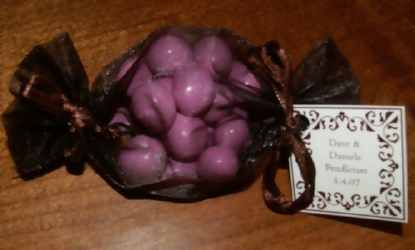 You could also use "confetti" (or candy coated almonds) in either pink or blue or nursery colors, and alter the poem slightly. "There is nothing like a baby boy, To fill your heart and give you joy." The baby shower turned out beautifully. We used lots of ideas from your website. Thank you so much! I took a medium size candle and printed out the picture and the words and put it on the candle with a heat gun. I think a great favor idea would be single servings of popped popcorn with a tag that says,"Ready to Pop!" Afterall, who doesn't like popcorn?! I hosted a gender neutral baby shower last year. It was a coed baby shower so we had friends of both parents at the shower. I used lots of pastel colors which are great to use during this time of year. 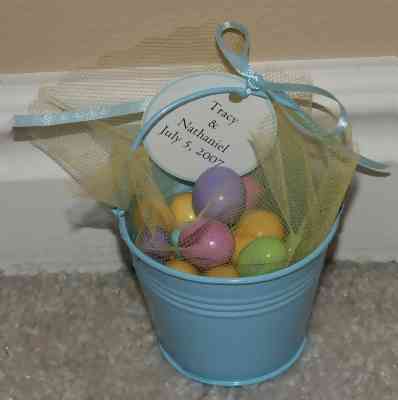 I purchased pink and blue pail tins and filled them with the bunny mix m&ms. 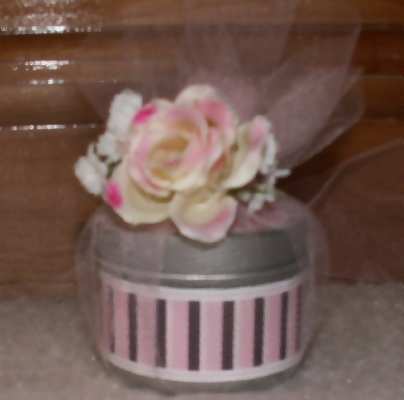 I used yellow tulle circles inside the pails and pink and blue ribbons to tie the tag on. By the way, great website! I love it! You could also use "confetti" (or candy coated almonds) in either pink and blue or nursery colors, and alter the poem slightly. 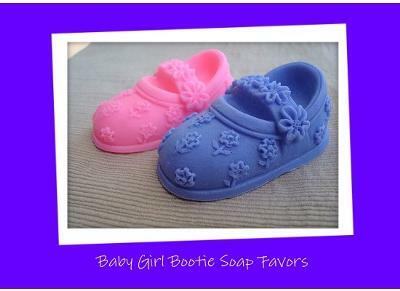 Share Your Favor Baby Shower Favor and Prize Ideas! 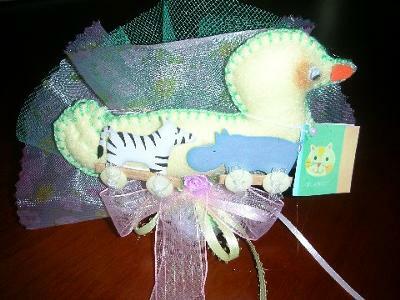 Got a great baby shower favor or prize idea? Inspire us with your creativity! 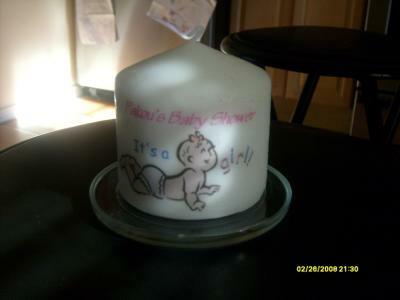 Your ideas will be posted to help hostesses around the world with their baby shower planning. What Type Of Favor or Prize Is It? Baby Sock Hat Candy Bar- I wrapped hershey candy bars with scrap booking paper and decorated them for a cute baby favor. Little Honey Jar- I made these honey jars for our momma-to-bee tea party. They turned out so cute! Crocheted Baby Botties- I crocheted baby booties for a recent baby shower. They were filled with butter mints. So cute!